This cart is ideal for dispensing steel strapping. 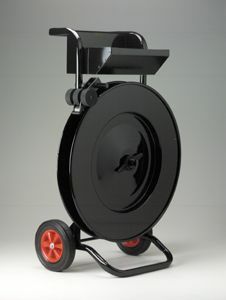 It accepts 16x3" cores and has an automatic brake that keeps your coil tightly wrapped. Like all of our products, this item is in-stock and ready to ship immediately. Please see our on-line catalog for a complete list of BrassPack's steel strapping coils, tools and carts. BrassPack Packing Supply, PO Box 1511, Mansfield, OH 44901-1511. Tel: 888-525-3357; Fax: 888-525-3392.